In nonstick Dutch oven or large saucepan, heat oil over medium-high heat. Stir in carrots, bell pepper and onion. Cook 5 minutes or until starting to soften, stirring occasionally. Stir in zucchini, garlic, oregano, brown sugar, chili powder, cumin, salt and pepper. Cook 5 to 10 minutes or until vegetables are soft, stirring occasionally. 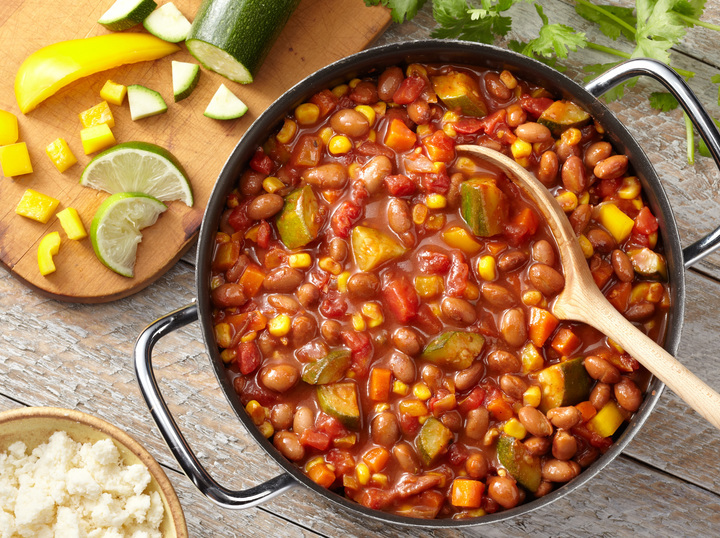 Stir in beans, corn, tomatoes and tomato sauce. Bring to a boil. Reduce heat and simmer 15 minutes, stirring once or twice. Serve individual bowls of chili with crumbled cheese, cilantro and lime. Tip: If you can’t find Mexican Cotija cheese, feta cheese has a similar tangy salty flavor.